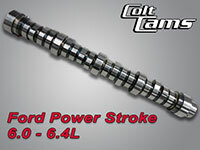 Colt Cams has worked with numerous performance shops over the years to perfect a suitable upgrade for your Ford Power Stroke 6.0 - 6.4L cam that not only performs better, but is reliable. These cams will help reduce EGT's (by getting the exhaust out of the cylinder and new air in), improve horsepower, improve the engine's performance throughout the entire rpm range (yes, you guessed it, by getting the exhaust out of the cylinder and new air in!) and can support up to 5,000 rpms. Click here to get the full story!